Amber is someone I started following on Instagram a few months ago she’s in her fitness journey too 🙂 We’ve connected a lot recently over random postings from clothes to recipes. I asked her to share the recipe of her latest post with me so I could share it with you! If you want to follow her too, her IG handle is @radiologyrhyner. I kinda just put this together off the top of my head, but I purchased the Veggetti. It’s like a Spiralizer. All you do is twist chosen vegetable through it – I did zucchini. Once I was done making the noodles (I used one whole zucchini) I started off with sautéing the “noodles” in a pan lightly coated with spray canola oil for about 7 mins on medium to high heat with garlic seasoning on top. At the same time in a separate pan, I added desired amount of shrimp. This I cooked in 1 tbsp of coconut oil & seasoned with Mrs. Dash garlic & herbs seasoning. Sauté for 4-5mins and voilá! Served together, noodles on bottom and shrimp on top. You can even put a little butter if you want to but it’s delicious! According to Amber this meal is low carb since the carbohydrates are coming from the zucchini, it’s also high in protein because she added shrimp. This will differ depending on the fish, poultry or red meat you add. Her suggestion for seasoning is to pick something you really like and you won’t need sauce or dressing. She even admitted to over doing it with Ranch dressing before. Girl- we have all been there! This is a great way to be creative with your food and try things you wouldn’t typically eat. I definitely need to get my hands on one of these devices and try out her recipe. I’m always looking for ways to make my veggies more fun! Yummmmmm. 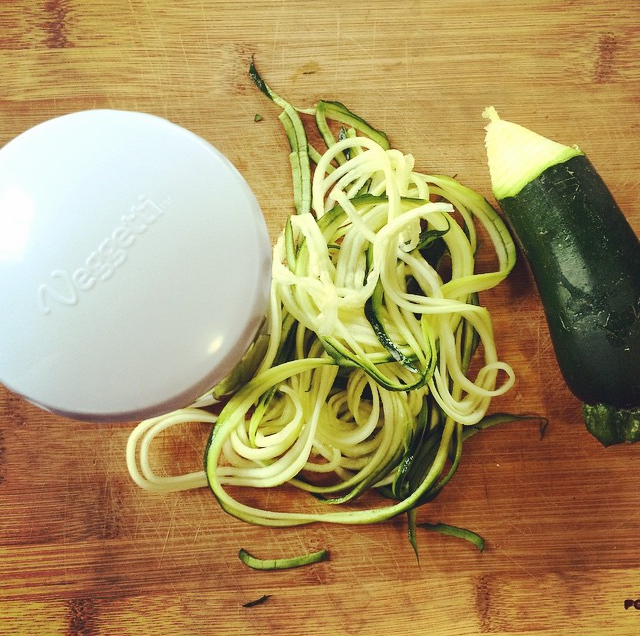 This spiralizer is something I haven’t tried! Looks good. Will definitely try to get a hold of one. Sounds much easier than the julienne peeler. 😊 thanks for the food idea!